Disclaimer: The Wood Database does not buy or sell any wood. Although this website contains links to other wood vendors, there is no wood directly for sale through this website. Please do not contact me about pricing or availability on a specific wood species. Much like other commodities, the price of different wood species will change over time. Because of this reality, wood prices have intentionally been described in the vaguest possible terms, leaving room for variability of wood prices. Domestic Woods: Generally wood that is harvested locally—whether that be in the same county, state, or country—is the least expensive; this makes perfect sense as transportation costs can play a large factor in the ultimate price of wood. However, scarcity, ease of access, drying costs, and a number of other factors also play a role in wood prices, thus resulting in a range of prices for domestic woods. With the exception of a few very rare domestic hardwoods (such as Desert Ironwood), the overall price range for domestic woods tends to be narrower than it is for imported woods. On the low scale are woods like Poplar or Aspen, while the upper range of commercially available hardwoods include woods like Cherry and Walnut. Imported Woods: On the whole, imported woods cost more than domestic woods. The least expensive imported woods may be on par with the upper price range of domestic woods—while the most expensive and rarest imported woods could easily fetch ten times the price of the commoner imported woods. There is a very broad range of prices in imported woods; some larger South American trees yield inexpensive imported lumber such as Cumaru and Jatoba, while some small, scarce trees can yield very expensive lumber, such as Ebony, Pink Ivory, or Olive. Figured Woods: Taking into account the source of the wood (domestic or imported) gives a good basis for determining a wood’s relative cost, but a third dimension in the equation is whether the wood has any special grain figure. Figured wood can include anything from simply being taken from a large (practically irreplaceable) mature tree, called “old growth”, to curly, quilted, birdseye, burl, or anything in between. In the simplest terms, figured wood adds another layer of scarcity to the pricing computation. Some forms of figure are relatively common (such as curly grain in maples), and only serve to slightly increase the base price of the wood, while other types of figure are seen much less often (such as burls, or strongly quilted wood), and may drive the price of already expensive woods to astronomical levels. Some examples of extremely expensive woods today would include Amboyna (burl), Snakewood (highly figured pieces with snakeskin patterns), quilted Sapele, and pieces of Koa with a strong curly figure. You’d think that woods that are hard to find would be expensive, but that’s not always the case. Sometimes, different wood species tend to go out of vogue, and what was once a popular wood 30 years ago can no longer be found for sale. This is particularly true for imported woods, because wood exporters simply won’t waste the time and money of importing lumber that won’t sell. But more than popularity and desirability, there’s also the straightforward matter of scarcity. 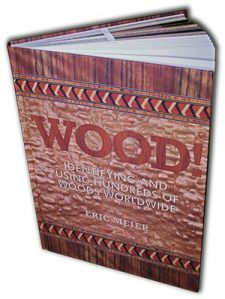 Wood may simply be unavailable (or difficult to find) for purchase because it is not commonly found. Additionally, depending on the size of the tree, or its common uses, the wood may only be available in certain sizes or forms. Some woods are primarily only sold as veneer, while others may only be sold primarily as flooring planks, or turning blanks, or plywood, etc. Any limitations in the available forms of the wood will be noted. Your article does not address availability of any of the popular woods. You speak in general about different types of wood. What about red oak, curly maple, samples, European beech, bamboo, hickory; etc. if your going to talk about some think be specific, don’t speak in generality!